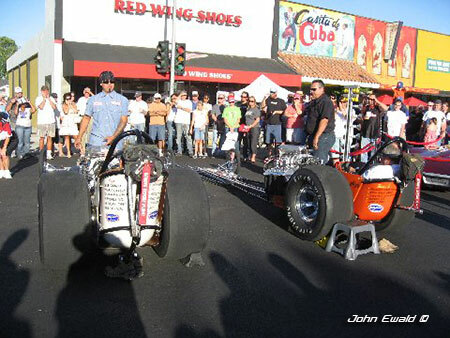 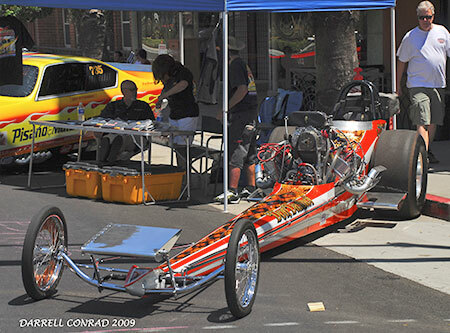 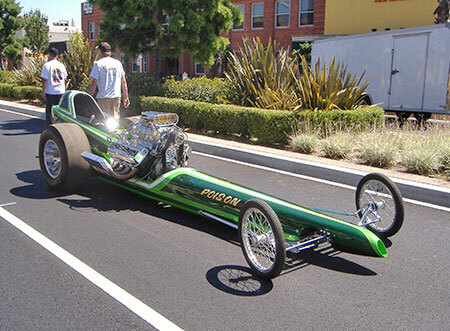 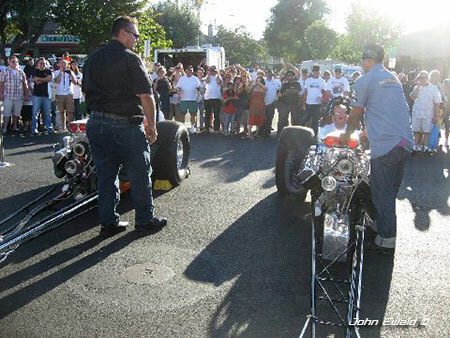 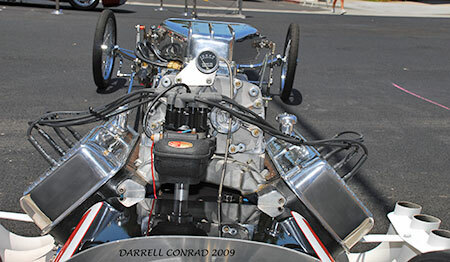 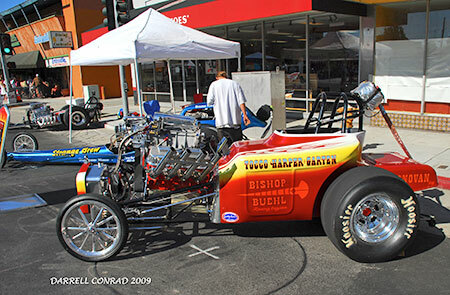 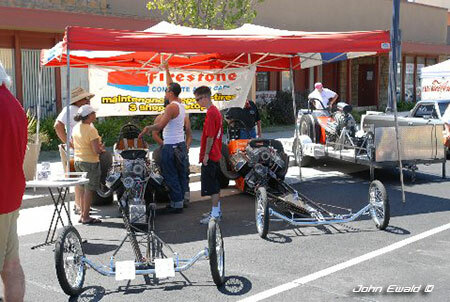 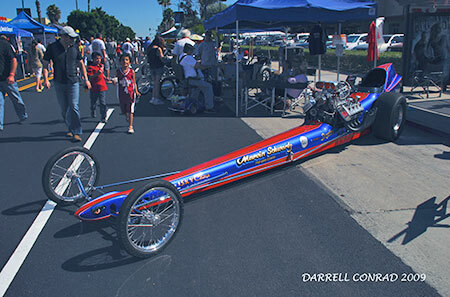 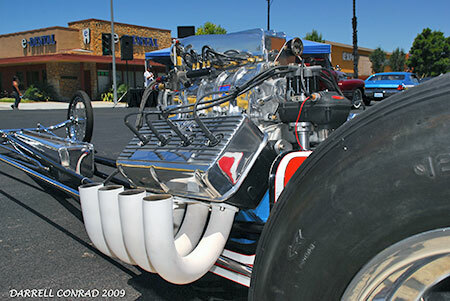 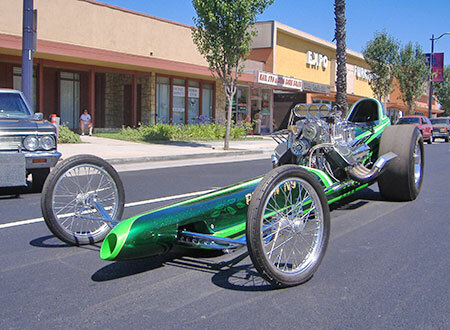 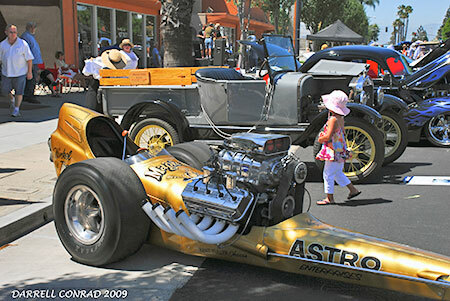 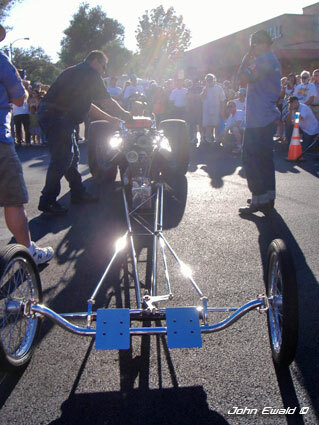 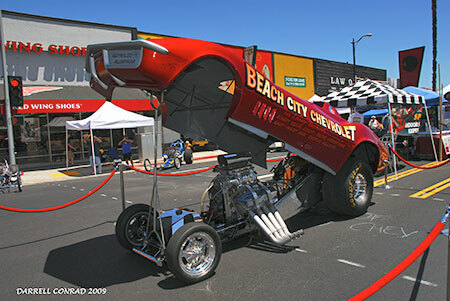 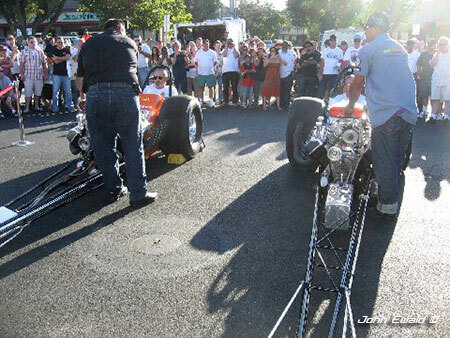 Long Beach, CA July 11, 2008  The forth annual Bixby Knolls Dragster Expo and Car Show once again graced the streets of the Bixby Knolls Business District in Long Beach , CA . 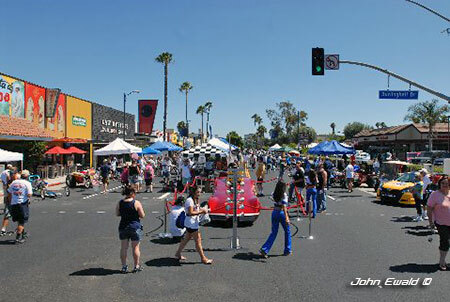 The event was staged, through the efforts of Rea Gabelich, a Long Beach city councilwoman and whirlwind of energy. 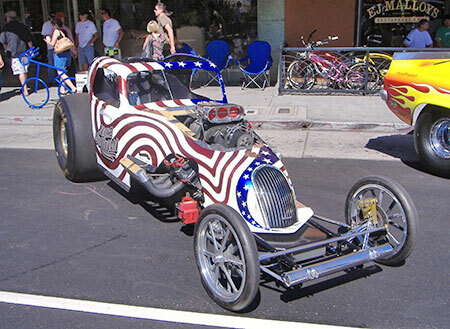 This years high-energy show featured more than 150 classic cars, street rods and specialty vehicles from all over Southern California . 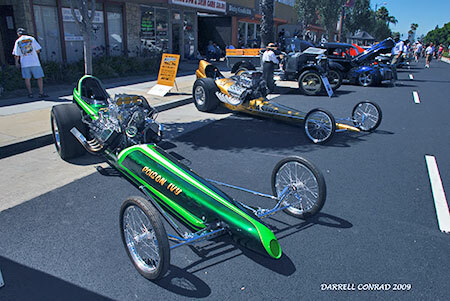 They were proudly displayed up and down Atlantic Avenue between San Antonio Drive and Roosevelt Road by their enthusiastic owners. 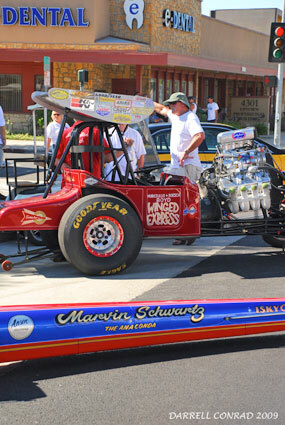 Each competed against the other for the coveted trophies in seventeen various categories. 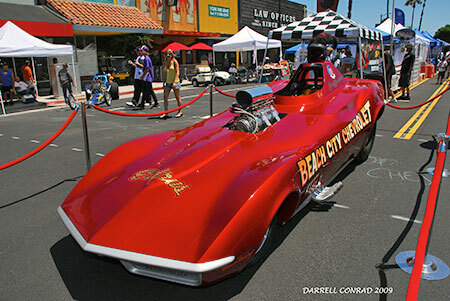 Photos by: Darrell Conrad and John Ewald. 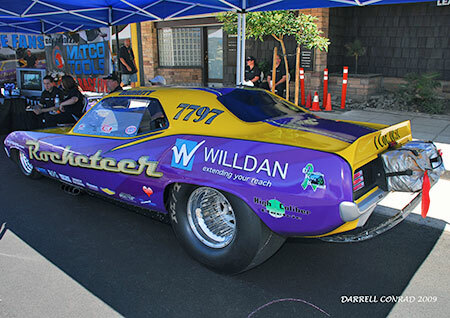 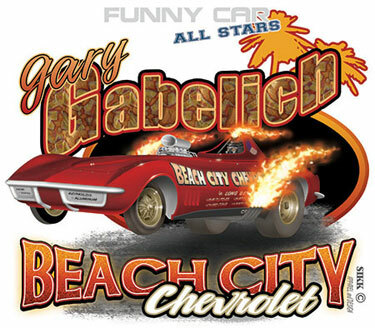 The theme of this years event was "Funny Car Allstars" featuring the recreation of one of the cars Rae Gabelich late husband, Gary drove which was the Beach City Chevrolet Corvette. 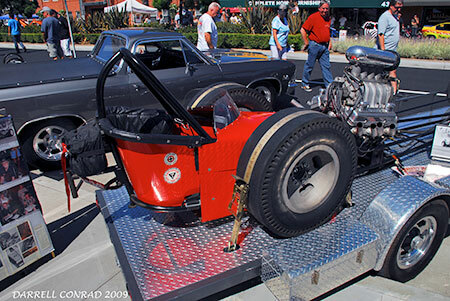 The original car burnt to the ground at Orange County International Raceway in 1969. 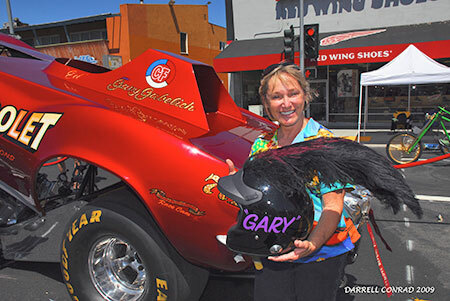 Rae Gabelich with Gary's signature plumed helmet that he wore in dragsters, drag boats and funny cars like the Beach City Corvette. 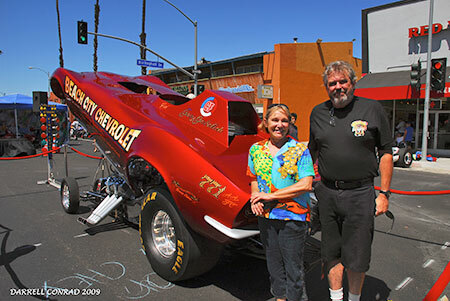 Rae with Don Danhof who is responsible for the recreated Beach City Vette. 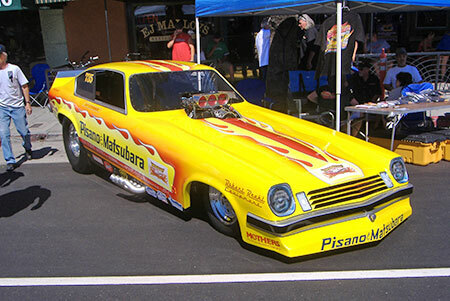 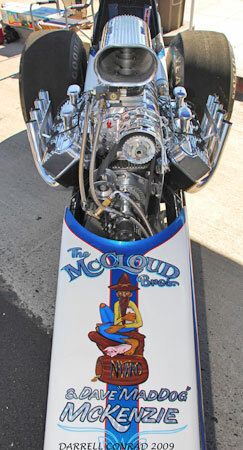 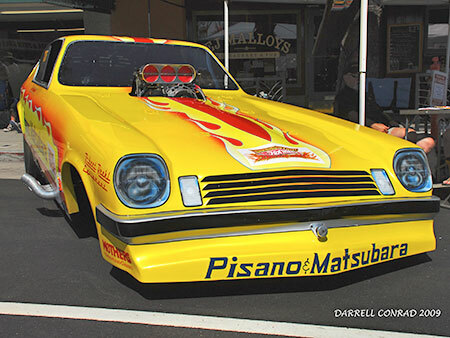 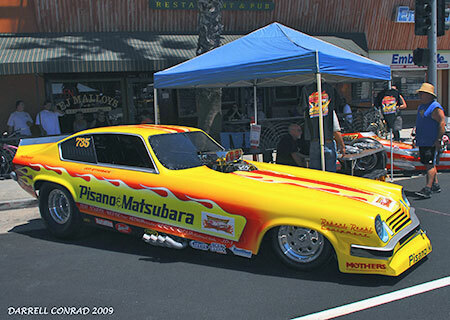 Among the other funny cars on display was the Pisano & Matsubara Vega and the Rocketeer Plymouth. 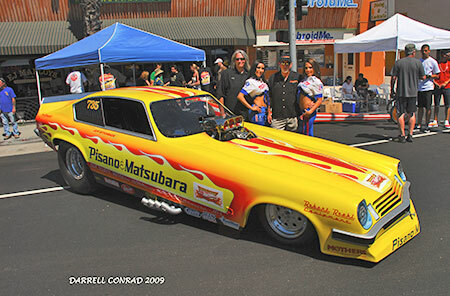 There were cacklecars a plenty including the Ewald BankAmericar, Mastercar and Ron Johnson's Shubert & Herbert. 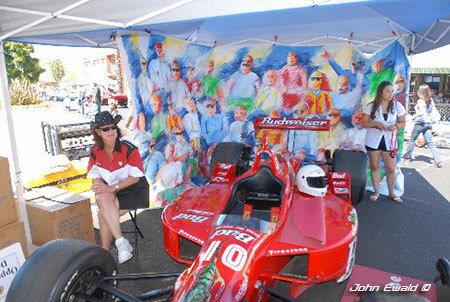 Jake McCloud thought he would enhance the Tecate girls by joining them in the photo with his car...NOT! 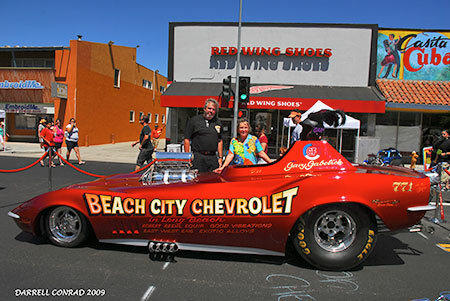 Bob Hirsch tried the same thing as Jake...well, the cars and the girls look great! 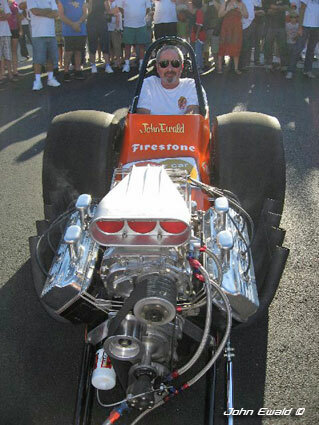 Ron Stearns finally pulled it off! 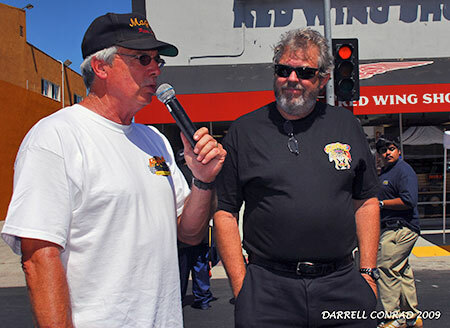 Rae Gabelich did a very brave thing...she turned over the MC chores to John Ewald. 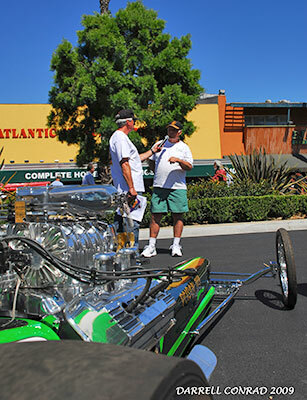 Actually he has a spiel that is very informing with regards to the history of the cars and what makes them tick. 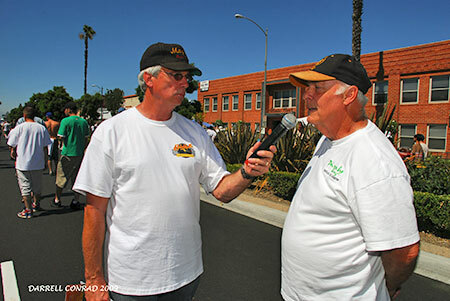 Joining Ewald was Bill "It' all my fault!" 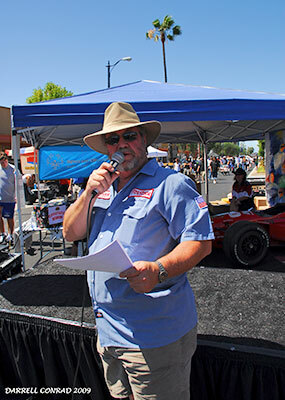 Pitts who went down the rows of the famous cars and interviewed the owners about the history of their cars, he did a great job and passed on some good information to the fans. 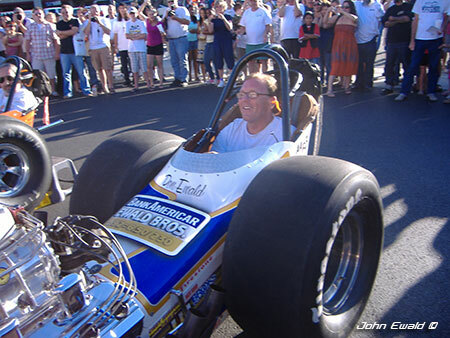 To help raise money for the Special Olympics John Ewald and Cynthia Carpenter brought their Budweiser/Firestone Indy car to the event and fans who made a donation got to sit in the car for a photo op. 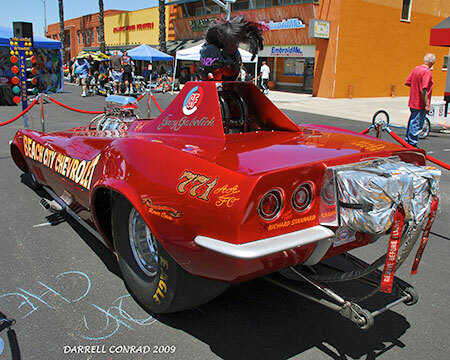 Cynthia always does a wonderful job welcoming guests into the car and raising money for needy causes. 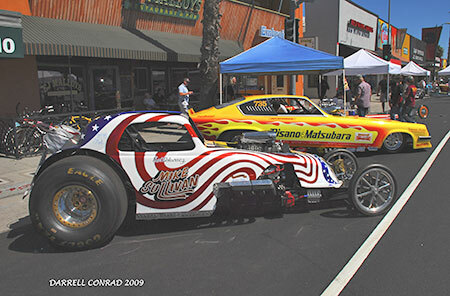 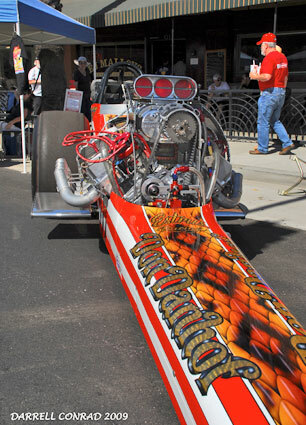 Although the event was planned to not have any fire ups somehow John Ewald didn't get the message and his BankAmericar and Master car made their way to center stage to entertain the fans who wanted their dose of nitro. 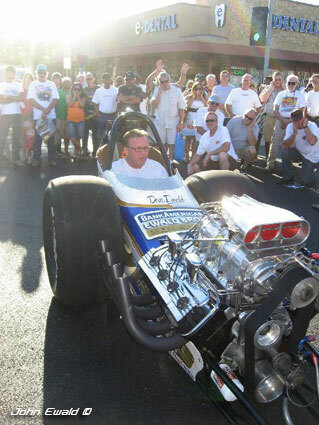 Seated in the seat of the BankAmericar was Randall Shipman, a fan of WDIFL.com who wrote the Ewald's asking to be part of the crew for a day...he got invited, drove 3 1/2 hours to the event...worked with the team and ended up in the seat for his "dream to come true" fire up. 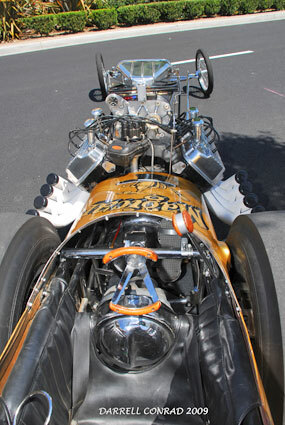 Seated in the Master Car was legendary photographer Alan Earman who has shot thousands of front engine dragsters photos but had never sat in one. 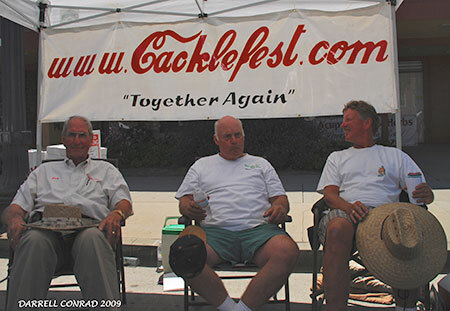 It was John Ewald's honor to give Alan his first "cackle". 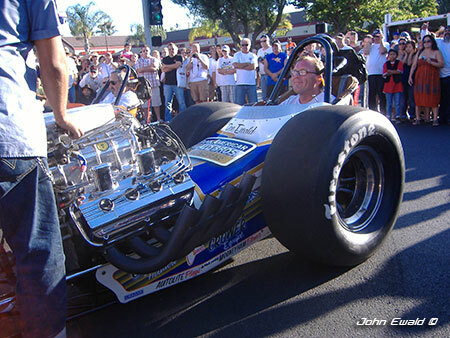 John had followed Alan as track photographer at Lions Drag Strip when Alan went on to cover national events back in the 1960's. 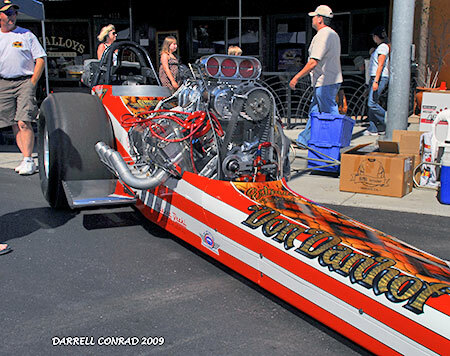 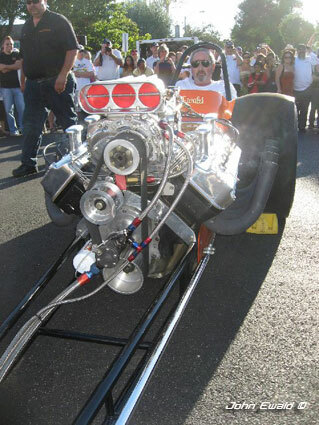 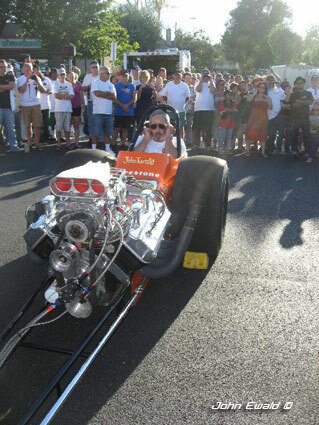 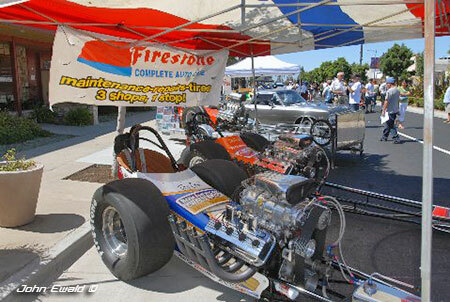 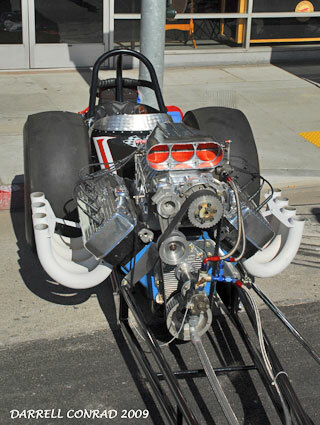 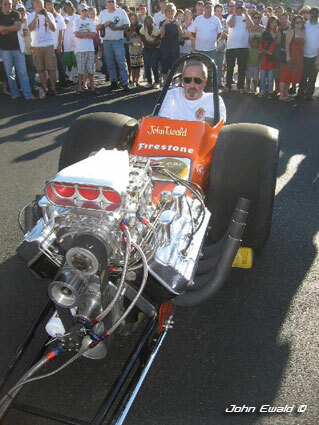 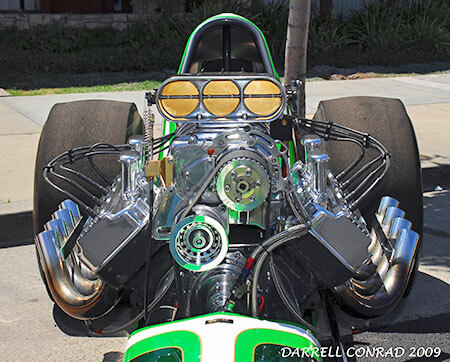 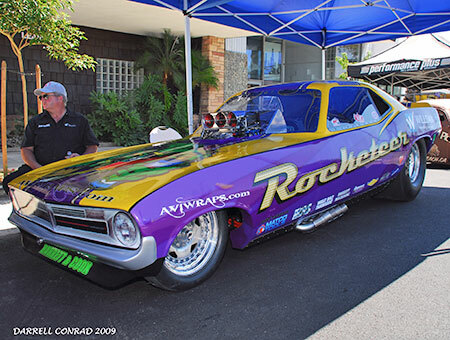 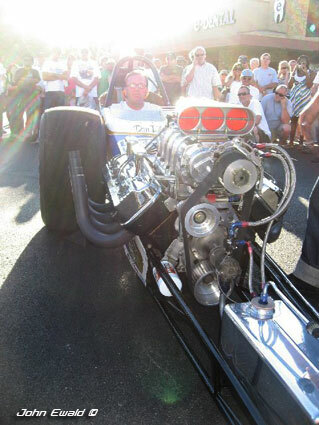 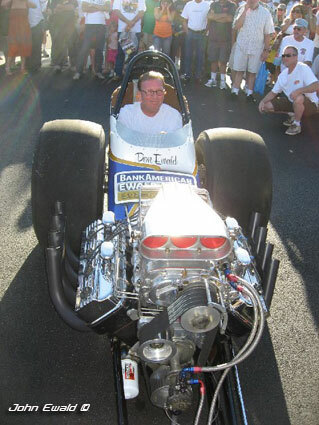 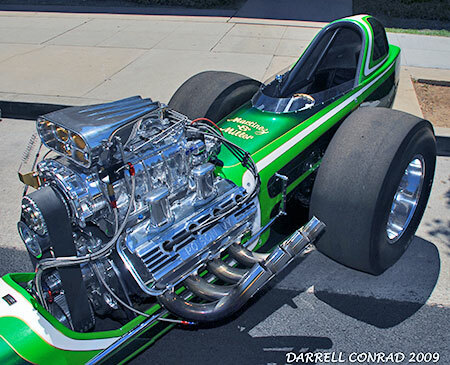 With regular crew chief Bob Danly out of town, the "Maxed Out" cars were put in the very capable hands of Alex Mikkelsen of American Roadster who along with crew member Mario Garcia gave the fans what they wanted...noise and nitro! 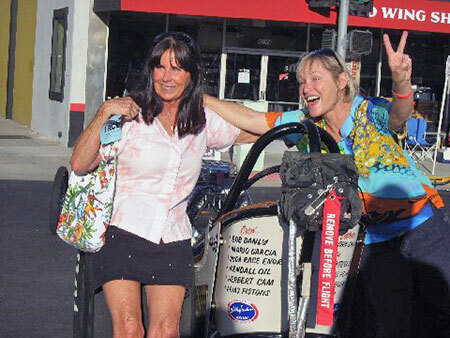 Rae Gabelich, on right, seemed to consider her event a huge success....so did everyone who attended. 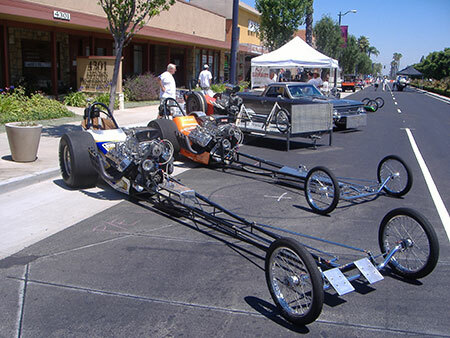 The "who started those cars?" 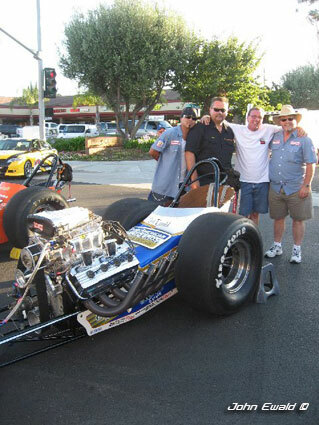 gang...Mario Garcia, Alex Mikkelsen, Randall Shipman and John Ewald. 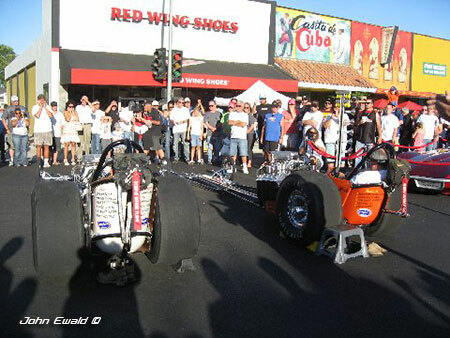 Don't know how it happened...the cars just started while Ewald and the crew were explaining how the cars work to the fans.